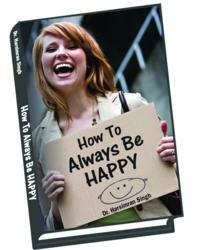 Never underestimate the power of positive thinking by Dr. Harsimran Singh. Positive thinking is the biggest secret to success of every successful person. Being happy and wealthy is very much related to having a positive attitude. The difference between successful people and others is not a lack of strength, but rather a lack of positive thinking. It should come as no surprise that many motivational, inspirational, and success-oriented books are rooted in positive thinking. Those who have created and found fortune and fame in various walks of life all claim to believe in this phenomenon called positive thinking. While fortune and fame may be added bonuses of thinking positively, most people just want to be happy. Such a large emphasis is put on positive thinking because it has the potential to affect one’s entire life. One’s thoughts control one’s decision-making actions in any given situation. When people walk through life looking at everything in a negative light, they become surrounded with worry and doubt. As a result, they make certain choices and decisions, often life changing, based on negative or positive thoughts. If people allow themselves to think positively and let those good thoughts shine through, they will almost always choose the best path and the higher road. People should make a choice for the better and make an effort to think positively. In every situation, good or bad, things could potentially always be worse. Looking at every situation and wanting to see the better or brighter side, is reaching towards living positively. Thinking positively allows to accomplish many more things in life simply because people allow themselves to try things they previously were unsure of or had doubts about. Perhaps one of the main reasons some people are more successful than others is because they think positively and take on more trials. Inspirational quotes are akin to a blazing fire. If fuel is not continually added, the fire gets extinguished. So keep on adding the fuel of positive thoughts. Dr.Harsimran Singh, Ph.D. migrated to the USA in 1973 with just $8 in his pocket. He is the author of 13 inspirational books including, “How 12 Immigrants Made Billions from Nothing.” He has earned the unique nickname "Trump with a turban”. He credits his success to Search Engine Optimization, which helped him have his websites ranked at the top of search engine results. He wants others to be successful as well. He wrote the book, “SEO Secrets to BIG Money” (valued at $45.95) which can be downloaded for free by clicking SEO.